The cerebrum is the largest portion of the brain. It performs the higher brain functions involved with sensations, voluntary actions, reasoning, planning, and problem solving. The cerebrum is composed of 2 large hemispheres (the left and the right cerebral hemispheres), which inhabit the anterior and middle cranial fossae and the supratentorial region of the posterior cranial fossa. The cerebrum is the largest part of the brain. A deep median longitudinal fissure named the longitudinal cerebral fissure partially divides the 2 hemispheres from every other. A huge commissure, the corpus callosum, whose fibres interconnect the corresponding cortical areas of the 2 cerebral hemispheres, is located in the floor of the fissure. Every cerebral hemisphere is made up of surface layer of grey matter named the cerebral cortex and a central core of white matter. In the basal part of the latter are situated large masses of grey matter, called basal nuclei/ganglia. The surface of cerebral cortex is convoluted, i.e., it’s a series of elevations, the gyri, divided by shallow depressions, the sulci, or deep grooves termed fissures. Frontal lobe: It’s essential for voluntary motor functions, motivation, aggression, emotions, affect, drive and comprehension of self. It is anterior to the central sulcus and above the lateral sulcus. Parietal lobe: It’s the major centre for reception and assessment of all sensory info with the exception of scent, hearing and eyesight. It is posterior to the central sulcus and above the lateral sulcus. Occipital lobe: It’s responsible for reception and integration of visual input signal. It is behind a line stretching from the parieto-occipital sulcus to the preoccipital notch. Temporal lobe: It gets and assesses stimulation for smell and hearing and plays a significant part in recollection. It is below the lateral sulcus and in front of preoccipital notch. Deep inside the lateral sulcus is located a submerged portion of cerebral cortex, the insula that’s frequently called the 5th lobe or the central lobe of the cerebral hemisphere. The so called limbic lobe is a complex bordering zone (limbus = border) between the cerebrum and diencephalon. It’s somewhat ring shaped. It’s related to basic survival instincts, viz. the acquisition of food and water and reproduction. It gives ability to shop and recover info and is especially essential for short-term memory. 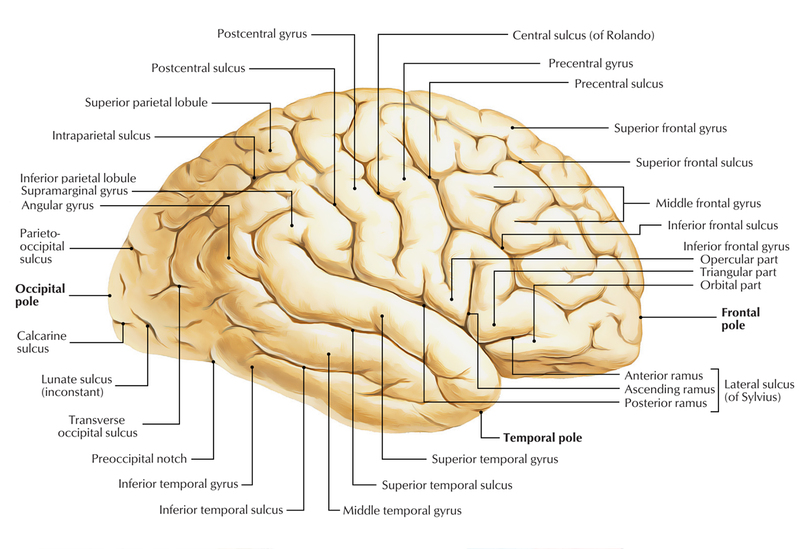 The medial surface of the cerebral hemisphere isvisualized in the sagittal section of the brain and presents a number of features shown. The inferior surface of the cerebral hemisphere is irregular and presents orbital and tentorial surfaces. The cerebrum is involved in the interpretation of sensory nerve impulses as sensations and in controlling voluntary motor responses, intellectual processes, the will, and many personality traits. 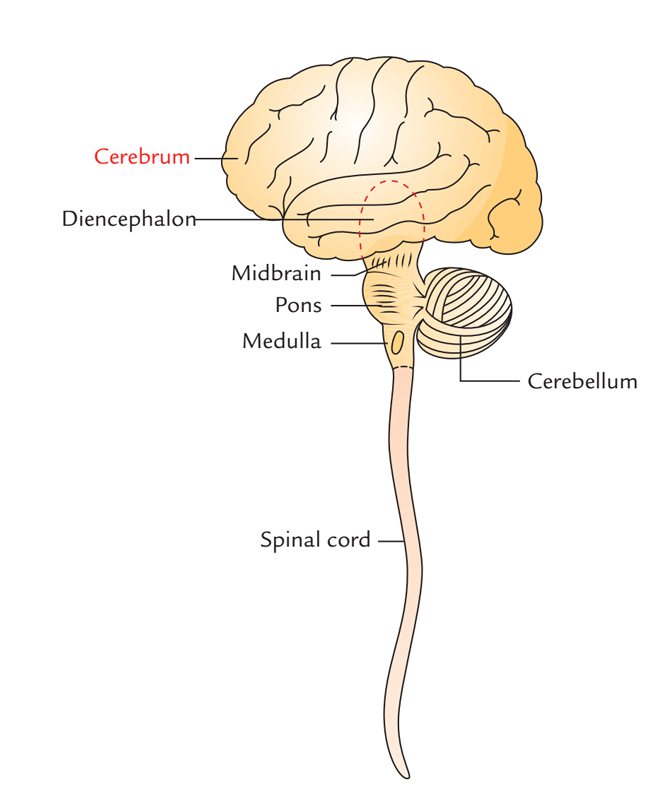 The cerebrum has three major types of functional areas: sensory, motor, and association areas. Sensory areas receive nerve impulses formed by sensory receptors and interpret them as sensations. These areas occur in several cerebral lobes. For example, the sensory areas for vision are in the occipital lobes and those for hearing are found in the temporal lobes. Areas identifying sensations from skin (cutaneous) stimulation lie along the postcentral gyri (gyri just posterior to the central sulci) of the parietal lobes. Sensory areas for taste are located at the inferior end of the postcentral gyri. The sensory areas for smell are located in the inferior part of the frontal lobe and the medial aspect of the temporal lobe. Ascending sensory axons carrying sensations from the skin cross over from one side to the other prior to reaching the thalamus. Thus, the postcentral gyrus in the left cerebral hemisphere receives nerve impulses from the skin on the right side of the body, and vice versa. Motor areas are located in the frontal lobe. The primary motor areas that control skeletal muscles lie along the precentral gyri (gyri just anterior to the central sulci) of the frontal lobes. The region anterior to the primary motor area is the premotor area. The premotor area is involved in complex learned activities, such as writing, tying your shoes, and driving a car. Also in the premotor area is the frontal eye field, which controls voluntary eye movements. The motor speech area (Broca area), which controls the ability to speak, is located near the inferior end of the primary motor area. It is found in only one hemisphere: the left hemisphere in about 90% of people. Descending motor axons cross over from one side to the other in the brainstem. Thus, the left side of the cerebrum controls skeletal muscles on the right side of the body, and vice versa. This area occur in each cerebral lobe, where they interrelate sensory inputs and motor outputs. They play critical roles in the interrelationships of sensations, memory, will, and the coordination of motor responses. The common integrative area is a major association area that is located at the junction of the temporal, parietal, and occipital lobes. It is involved with the interpretation of complex sensory experiences and thought processes. The posterior language area (Wernicke area), which is an association area located in the temporal and parietal lobes, is used to interpret the meaning of spoken and written language. Like the motor speech area, it is found in only one hemisphere: the left hemisphere in about 90% of people. The prefrontal area, which is located in the anterior portion of the frontal lobe, is involved with functions such as planning, complex behaviors, conscience, generating personality, and executive functions. Executive functions include distinguishing between good and bad, understanding future consequences, social control of urges, and working towards a goal. Portions of the prefrontal area are not fully developed until a person is in his or her 20s, which is why teenagers often have issues with impulse control and poor decision-making. The two cerebral hemispheres perform different functions in most people, although each performs basic functions of receiving sensory input and initiating voluntary motor output. In about 90% of the population, the left cerebral hemisphere controls analytical and verbal skills, such as mathematics, reading, writing, and speech. In these persons, the right hemisphere controls musical, artistic and spatial awareness, imagination, and insight. In some persons, this pattern is reversed; in a few, there seems to be no specialization. Men also have greater lateralization than women, which is why damage to a hemisphere can have greater effects in men. The basal ganglia are subcortical masses of grey matter that are situated in the white core of every cerebral hemisphere. The basal ganglia contain corpus striatum, claustrum and amygdaloid body. During the development of links between the cerebral cortex and the brainstem, the bundles of fibres converging as internal capsule partially break up the corpus striatum into a medial caudate nucleus and a lateral lentiform nucleus. Between the internal capsule and the cerebral cortex, the nerve fibres diverge as the corona radiata. Functionally, the basal ganglia also contain the subtha-lamic nucleus of diencephalon and the substantia nigra and red nucleus of midbrain. The basal ganglia help determine the attribute of motor performance and are from time to time called extrapyramidal nuclei.